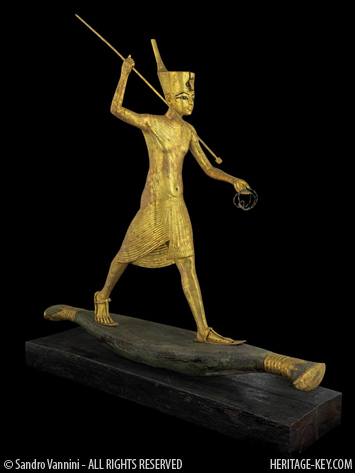 A new study shows that Tutankhamun, Egypt’s famous “boy-king” who died around the age of 18, suffered a “massive crushing tearing injury to his chest” that likely would have killed him. 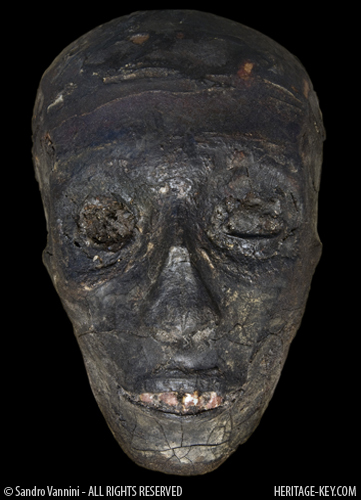 More proof that Tut suffered a major chest injury is found in the technique that Tut’s embalmers used to take out his intestines, liver and stomach. In Ancient Egypt those organs were removed after death and put into canopic jars (video: King Tut’s canopic shrine and jars introduced). Also Tut’s arms were crossed at his hips, not at his chest, as would normally be befitting a pharaoh. There’s more evidence that Tut’s chest, including the skin, had been gouged away while he was still alive. When Carter examined the bib he was impressed with how adherent it was. “It was so adherent that he couldn’t successfully remove it,” said Harer. Carter didn’t hesitate to remove other parts of Tut’s body, he actually hacked off the limbs in order to aid the autopsy. Chased by Hippos – Watch towards the end of the video, where you’ll see a hippo ferociously attacking a boat. Instead, at his Toronto lecture, Harer brought up another, more exotic possibility – that Tut was killed by a hippo. Still, it’s tempting to imagine Tut trying to hunt a hippo. Despite his club foot and malaria, it’s enticing to believe that the teenage pharaoh decided to hunt one of the most dangerous animals in the world. If his goal was to increase his fame then he succeeded far beyond expectations, in death becoming the most famous Egyptian ruler who ever lived.